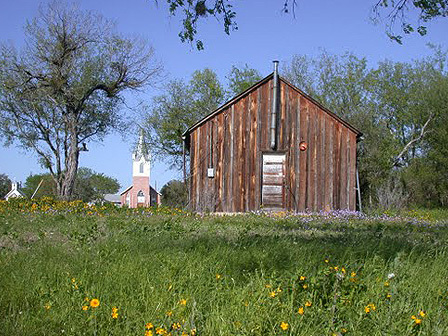 The village of Quihi lies 30 miles west of San Antonio. Ancient Indian tribes named the area for the Mexican eagle and camped around Quihi Lake because of the abundant game there. They left campsites with artifacts carbon-dated thousands of years old. In 1846 ten families came to Quihi Lake by oxcart from the Indianola seaport and established farms and homes. Later, these settlers built European-style limestone cottages. Many of the current 200 residents in this quiet, picturesque settlement are descendants of those original settlers. Quihi is threatened today by noise pollution and the deterioration to its sense of place because an aggregate company is planning a 50-year project to mine 200 million tons of crushed limestone on 1760 acres near Quihi. Hundreds of 78,000 pound trucks and a 7-mile railroad with 400 railcars would travel through the Quihi area daily, posing serious risk to the structure and stability of the buildings. UPDATE (June 2014): While the immediate threat of the railroad has been avoided, some of the structures still need to be restored. Unfortunately, the Stormhill Schoolhouse has been purchased and demolished for lumber.